David Tennant has had a go. Benedict Cumberbatch has taken a stab at it. 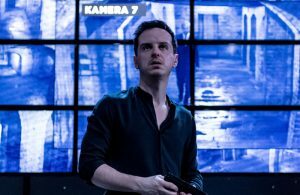 And now fellow star of BBC Steven Moffat dramas Andrew Scott – Moriarty in Sherlock – is giving us his apparently compulsory Hamlet. When will it be Martin Freeman’s turn, I wonder? Or Billie Piper’s? Actually, there’s a thought. 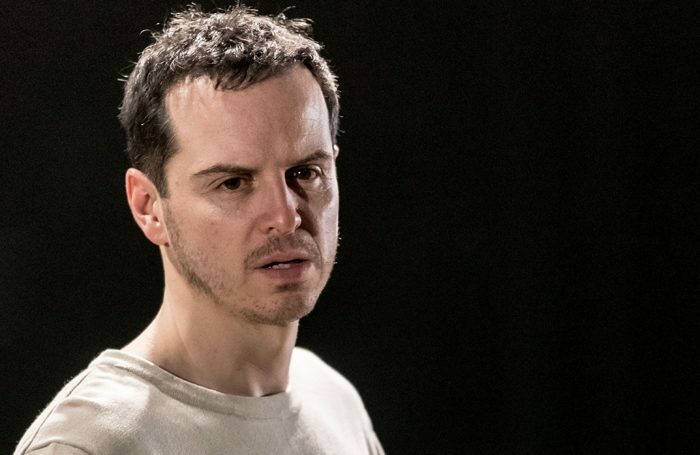 Scott is easily the most hotly anticipated London Hamlet since Cumberbatch back in 2015, but whereas Cumberbatch had the cavernous Barbican auditorium to contend with, Scott has the intensity and intimacy of the Almeida in which to play. And instead of Lyndsey Turner as a director, he has Robert Icke, a man repeatedly – religiously – referred to as the great hope of British directing. The next big thing. Our very own Ivo van Hove. 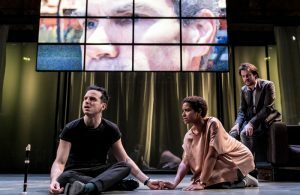 Icke’s Hamlet follows hot on the heels of his Mary Stuart, which was widely considered one of the best productions of 2016. It’s already sold out online, and with no live screening announced, the day tickets queue – which reportedly formed at 5am this morning – might be your only hope. Is it worth getting out of bed for, though? Is Scott’s take on one of theatre’s greatest roles worth the weary-limbed, bleary-eyed, six hour wait? Does Icke’s production live up to the hype, or (like that last series of Sherlock) is it going to disappoint? Hamlet – 221B or not 221B? Scott’s last stage role was in The Dazzle at Found111 in late 2015. Since then, he’s graced both the big screen, in David Hare’s Denial, and the small, in Sherlock. Is this a welcome return? Does he bring the fleet-footed fire of Moriarty to Elsinore? Paul Taylor (Independent, ★★★★), Sarah Crompton (What’sOnStage, ★★★★★) and Andrzej Lukowski (Time Out, ★★★★★) march to the same beat. For Lukowski, Scott provides “live wire, edge-of-the-seat stuff.” For Crompton, he turns “famous soliloquies into acts of intimacy with the audience.” And for Taylor, this is a Hamlet you feel “soul-to-soul” with. 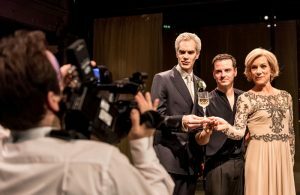 Is Robert Icke still the next big thing? Or is he simply the big thing now? After winning an Olivier for his stunning adaptation of the Oresteia, after having his Headlong production transfer to both Broadway and the West End, after directing a David Hare play at the National, and after providing two of 2016’s most memorable productions in Uncle Vanya and Mary Stuart, it’s pretty safe to assume the latter. And what radical reimagining has he served up here? Bob Dylan songs regularly float across the auditorium. The Ghost of Hamlet’s father is first seen on CCTV. Polonius wears a wire. And Icke’s unusual version – which includes several oft-omitted scenes – proceeds at a slow, unhurried pace, taking four hours in total. The whole thing is, in short, very Icke-ian. Others interpret it differently. Waugh thinks it is “a tale of suffocating sorrow”, Ian Foster (There Ought To Be Clowns) is struck by images of shattered families, and Billington and Letts are not alone in considering spying and surveillance the key to unpicking this lock. But then, different interpretations are to be expected. This is Hamlet, after all, and a Hamlet directed by Robert Icke to boot. Hamlet – What players are they? But this isn’t just a two-man show. Alongside Scott, Icke has assembled a strong cast, largely made up of previous collaborators. His Claudius – Angus Wright – has previously popped up in 1984 and Oresteia. His Ophelia – Jessica Brown Findlay – in Oresteia and Uncle Vanya, and his Gertrude – Juliet Stevenson – was both Elizabeth I and Mary in his role-swapping Mary Stuart. Lukowski is impressed with the “increasingly harrowing vision of increasingly fierce, instinctual maternal love” she offers. Tripney is not alone in remarking how “genuinely besotted with each other” Wright’s Claudius and Stevenson’s Gertrude seem. There’s much praise for Peter Wight’s fatherly Polonius – “superb”, according to Taylor – and for Findlay’s Ophelia too – “absolutely the best Ophelia I’ve ever seen”, according to Haydon. For Crompton, the whole ensemble is stuffed full of “beautifully pitched” performances. “Even Rosencrantz and Guildenstern, in the hands of Calum Finlay and Amaka Okafor are cleverly and movingly differentiated”, she writes. Go Team Icke. Hamlet – Is it any good? Icke’s Hamlet has got five stars from The Stage, Time Out, and What’sOn Stage, but only three from the Guardian and the Telegraph, and two from the Times. It doesn’t take a genius to observe the fault along which this particular battle-line runs. If you’re an Icke fan already then you’ll love it. It’s saturated with his familiar, forensic style, full to the brim with daring, insightful touches, and unafraid of lingering. Be warned, though: Scott’s an actor, according to Tripney, “who can break you if he puts his mind to it”.